The Russians trapped in a submarine beneath the Pacific Ocean for three days would have died had it not been for British help, a naval expert says. 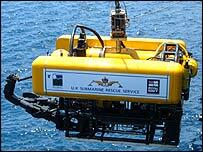 A British team used a remote-controlled mini-sub to cut free the vessel, which became snagged on debris on Thursday. The mini-sub Priz had dropped to 190m (620ft) off the Kamchatka peninsula. Commander Ian Riches, of the Submarine Escape and Rescue team, said conditions for the seven crew, who all survived, would have been "pretty awful". "If we'd not been able to cut them free... they would have died," Cmdr Riches said. "From the Russian perspective, it was probably getting quite cold, dark because they would have been saving electricity; the atmosphere would have been getting quite foul with a rise of carbon dioxide which would have been making them quite unwell." Cmdr Riches said the Russians had learned valuable lessons from the sinking of the submarine Kursk five years ago, when the authorities were criticised for not asking for international help soon enough after all 118 crew on board died. He said the Russians were now more willing to ask for expertise. The British rescuers hoped to meet up with the seven Russians whose lives they had saved. Cmdr Riches said: "We are keen to meet them and shake their hands." 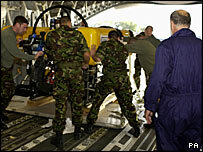 The British Scorpio craft, an unmanned underwater robot, sliced through nets entangling the submarine, stranded for three days beneath the Pacific Ocean. Russian defence minister Sergei Ivanov rang Mr Reid to offer his thanks. "The rescue operation has had a happy ending. I thank everyone, including of course the British rescuers," Pacific fleet commander Admiral Viktor Fyodorov said. A spokesman for Prime Minister Tony Blair said he had also been closely following events. The Russian submarine's crew had faced dwindling oxygen supplies and low temperatures. On Sunday, the Russian Foreign Ministry gave its "profound thanks" to the UK, Japan and the US for their aid. Mr Ivanov offered his "deepest thanks and appreciation". "The UK were the first to come, they played a crucial part and we do appreciate that. This was an ordeal for seven families and I send my thanks to the Royal Navy." Defence Secretary John Reid said: "Britain has a world-leading capability in the field of submarine rescue and we have been able to utilise that capability to save lives." The rescue team included members of staff from Cumbria and west Scotland employed by specialist marine firm James Fisher Rumic. And Commander Jonty Powis, a Royal Navy specialist on submarine escape, said the rescue was "an excellent result". "We were conscious that the crew were running out of oxygen and that we could not afford any great delays in cutting them free." The British vehicle, known as a Remotely-Operated Vehicle (ROV), is an unmanned remote-controlled submersible that is used in situations that are too dangerous or too deep to send divers. Assistance was provided by a team of Russian experts and a small team of US divers who assisted with breathing apparatus. The Priz - itself a rescue vehicle - had been on a training exercise when it got snagged. The crew had reportedly coped with the temperatures of around 6C (42.8F) and dwindling oxygen supplies by wearing thermal suits and keeping still. Reports varied on the cause of the sinking. Officials said the mini-submarine was trapped by both a vast fishing net and an underwater antenna. The Scorpio was accompanied by an operating crew of eight civilians and one Royal Navy member - as well as 20 other staff, including British police officers.